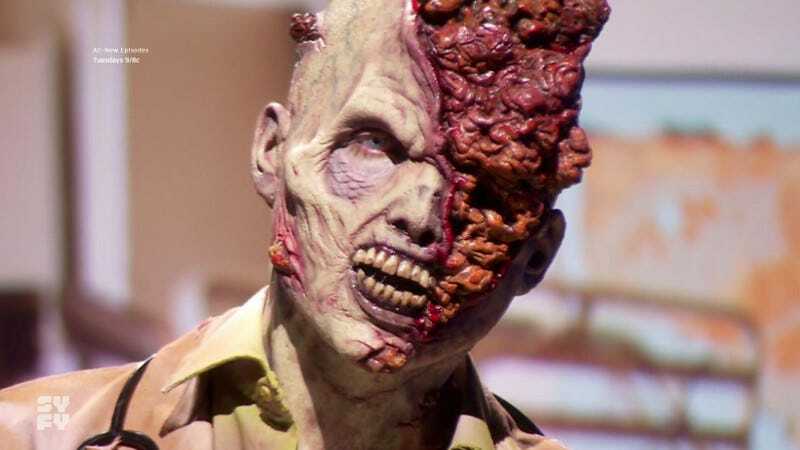 On this week’s Face Off the two contestant effects shops must create zombie-like victims of a fungal infection. Who will have all the gifts and who will be consumed by their fungus? Results ahead. McKenzie Westmore meets the six remaining contestants at the lab to introduce this week’s challenge. Each shop will be creating three characters at different stages of infection - 1 day, 7 days, and 30 days. Kierstin is foreman for Ethereal Effects which chooses the octopus stinkhorn as their fungus. Andrew is foreman or Twisted Six Effects which chooses the brain mushroom. Video game writer, creative director, and programmer Neil Druckmann is a guest judge this week. While the work was done as two competing shops, the results are judged individually to select the Final Five for the semifinals (no shop is declared a winner). It’s not surprising that the two experienced contestants are top looks. KC wins this week’s challenge. The judges say her creature looks most like something that could be in a video game. Kierstin is the other top look. This time she does what she should have last week with some prosthetics and a strong paint job. Nelson is a bottom look but he makes the cut for the Final Five. Faina has a bad week trying to get the paint job for her 7 day infection to look like it fits between the 1 day and the 30 day looks. And the judges aren’t thrilled with the look of her fungal infection. But she still snags the final spot in the semifinals. Phil’s infection looks almost more like burns to the judges (something Michael Westmore warned Phil about) and he is eliminated this week. Barring a spectacularly bad week for either of them, KC and Andrew are shoo-ins for the finale. Faina is my top pick for the third spot in the finale but it’s not a sure thing.